- Dat steamy forested area. Panjama Jungle is pretty large, compared to most maps, and there are a few different ways you can proceed around the area. Assuming you’re entering Panjama Jungle from Panjama Island’s ‘normal’ entrance you’ll appear in the northwest, and we’ll proceed from there. If you come by the Pilot’s helipad you’ll appear in the east instead. Crazy Clubbers. 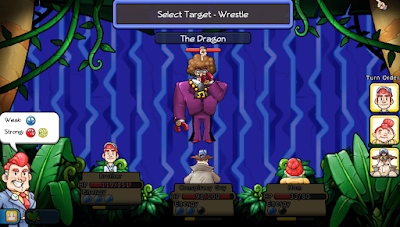 Normal attackers most of the time, Crazy Clubbers have the nasty tendency to defend themselves, or other characters, and strike back if you attack. 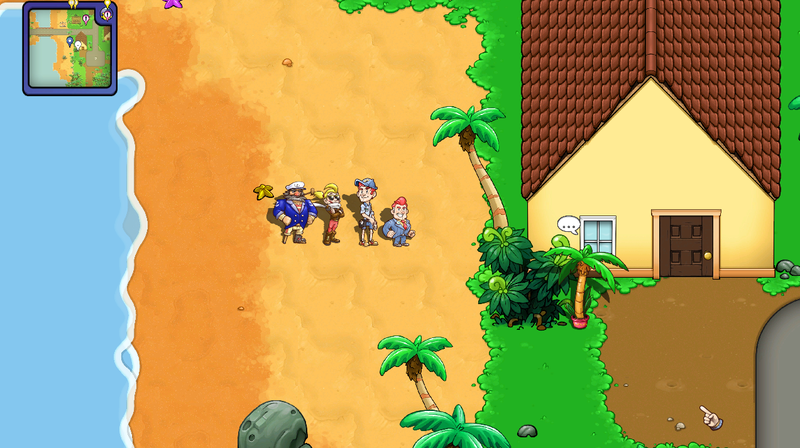 Hopefully you can one-hit kill them; poisonous attacks will help. You can receive Slide Rules for the Architect from Crazy Clubbers. Limbo Ninjas. Though not terribly powerful on their own, where they’re left exposed to attack, Limbo Ninjas are quite dangerous if given a few turns to charge up their attacks. Try your best not to fight them alongside Crazy Clubbers. Verbal attacks take them down quickly, and high-accuracy attacks in general are wise. Speakers. These special enemies hang out near crowds, and favour verbal attacks. Nothing terribly special, aside from their fairly-high health and ability to counter attacks via feedback loops. Electrical attacks work best. - Your path is blocked to the east, so head south, sticking to the right side of the path. You’ll find some Bread on your way south, and not much further south is a cave. The path continues south, but, again, it’s blocked. Into the cave. - By god, there’s some sort of structure in here! Lots of enemies, too. Check to your left for a Bun, then head north. (Be careful about the southern door if you want to weave around enemies. The trigger area for going back outside is annoyingly large.) There’s Bread on your right in the north, and you’ll emerge back outside. - To the north you’ll find a Speaker. Destroy it and you’ll disperse the crowd, allowing you to return to Panjama Island if you wish. Head east and south to find another crowd; head left from the crowd, then north, to find $500 on the edge of a cliff. From this point you’ll want to go south until the path branches to the southeast and southwest; go southwest to find another Speaker to destroy and another crowd to disperse. - Cross the bridge on your right. You’ll be forced along a southeastern path across some olive-coloured grass, past another crowd, and up towards the Jungle’s helipad entrance. At this point you have a choice: either you can head south and cross a bridge towards the centre of the map or head north and loop around towards the centre. We’ll take the longer, northern route. - Another indoor area. You’ll find a Muffin and a Crab Roll down an eastern passage, some Coffee down a western passage, near the lingering Gardener (assuming she’s not in your party), and a Cola by the northwestern exit. Just outside the cave you’ll find $1,000 and a Ristretto. 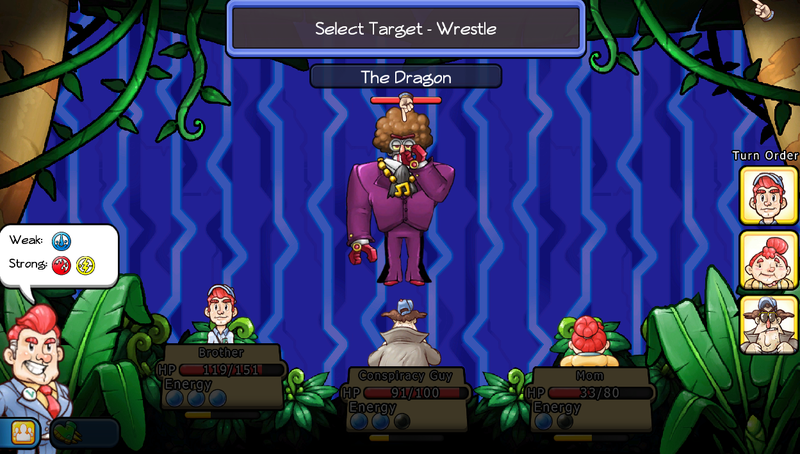 The Dragon in Citizens of Earth. He doesn't look very reptilian. Another of these robots, eh? The Dragon is relatively tough, with a wide arrange of single- and multiple-targeting attacks, the most dangerous of which can burn a single character. Nevertheless, not a big deal, so long as you have any sort of hydro attack to smack him down quickly. Do enough damage and he’ll flee. - Once you’ve beaten The Dragon, continue west and swing south. You’ll find a Donut waiting. That done, leave the Jungle through the northeastern exit. You’ll emerge back at Panjama Island. Check the box on your left for a Devil’s Food Cake, then destroy the Speaker to regain access to the west side of Panjama. That done, head up to the stage in the northeast to confront the main troublemaker of this place. DJ Voodoo, lord of funk in Citizens of Earth. 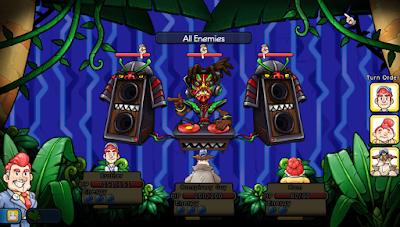 He terrorizes Panjama Island with sick beats. This can be a tough fight with a poor setup. DJ Voodoo isn’t an especially imposing foe on his own, relying primarily on basic physical attacks, but he’s accompanied by two Speakers which can slightly bolster his abilities. He can also restore them to full life if they’re destroyed - and, as an additional insult, he’s capable of reversing the effects of combat moves for a turn, so your attacks will heal rather than hurt. As such you should make taking the DJ down your top priority. Go at him with hydro attacks, if possible, and ignore the Speakers until the DJ is toasted. If you’re strong enough you can potentially get the DJ to waste his turn restoring a Speaker to life, but this more or less requires one-shotting Speakers, and if you can do that then the battle isn’t very difficult anyway.